In order to take the best advantage of the changes taking place in CAD it is important that the UK approach to the introduction of information modelling technology is properly understood, coordinated and managed. The purpose of this paper is to plot the state of current practice in the production of the information that describes construction projects, promote a common understanding of information modelling and create an agreed ‘definition’. Whilst it is important to look both to the extreme forefront of UK practice and overseas for examples and indeed inspiration, the immediate and pressing need is to prepare a workable consensus for contemporary and mainstream UK construction. By working on a single model from early design to completion and beyond, every schedule, drawing sheet, 2D view, and 3D view are a direct presentation of information from the same underlying database. The data can be used to drive automated checking, construction or maintenance process. All of the team(s) work on the same information, so that changes are automatically coordinated across all representations of the project and potentially through its entire lifecycle. At the risk of being anthropomorphic, the model knows more about the building than it does about itself. Using a single model environment has been shown to create huge savings in waste of all kinds and hence cost. Intelligent use of information modelling technology can only produce further savings. Why now and why so pressing? It is a cliché but true that Information Technology has rapidly taken over so many aspects of commerce and life generally and the majority of us have struggled to keep up. Even those of us who feel that we can keep pace reasonably well, probably don’t realise how much of the potential in the “boxes of tricks” on our desks we do not use or maybe use ineffectively or possibly even improperly. Transferring information from designers to the producers (constructors/installers) in the construction process is an example where, with the availability of modelling software, we are on the verge of a watershed. Understanding the basic information transfer requirement is as major an issue, however, as the technology itself and the way in which it is used. The software vendors will have solutions to the technology issues but they will not have the expertise to define the ‘problem’ and we should not expect them to. The RIBA and other professional bodies and organisations such as CPIC and BuildingSmart recognise this and have come together to create a brief statement to promote a common understanding of the steps involved and propose a definition. We hope this will aid comprehension and attract a wide endorsement including that of Government both as an advisory body through BERR and as leading customer for construction services through the purchasing departments in for example Health, Education and Defence. The importance of this unified support is better understood from a description of the principles using the main vehicle for the definition – a diagram created and refined during 2008 by Mark Bew of BuildingSmart and Mervyn Richards of CPIC. 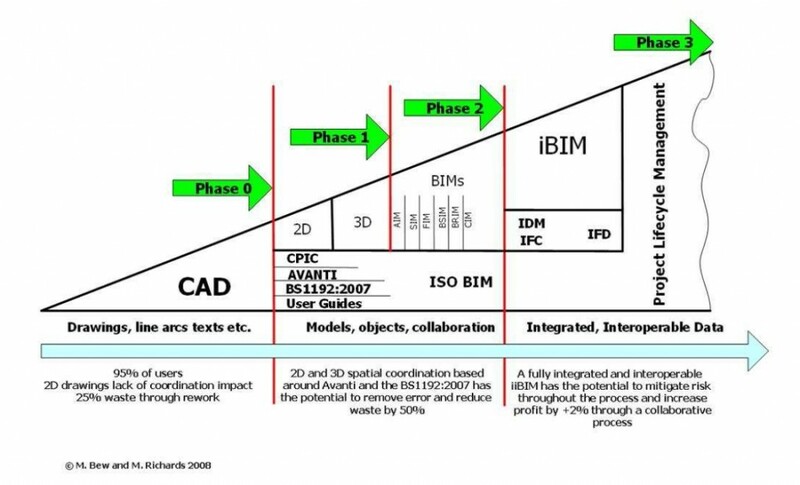 The diagram is an illustration of the evolution from what may now be called ‘traditional’ CAD (Computer Aided Drafting) at the left to an integrated and interoperable Building Information Model (BIM or iBIM). Several versions of this illustration exist both from the development process by its authors and from its use to emphasize particular aspects. It has also been ‘borrowed’ by others. The version here is generally agreed to be the steady state version from which a useful definition can be created. In some ways the diagram is almost best left to stand alone without further definition beyond what the three letters stand for – BIM: Building Information Model. Or is it Building Information Modelling? As an activity rather than a ‘thing’ this certainly sounds more promising. It seems to fit well with the thrust of this paper and maybe the last thing we should do is invent another radically different definition. This paper argues that whilst BIM is here to stay and represents the future there is some confusion about what exactly it is and how it should be best utilised and implemented. Using its three-dimensional capability to produce visualisations is becoming widespread and there is nothing wrong with that as far as it goes. However limiting use like this is not exploiting the true potential for providing real through life and holistic information about the building/construction. This is where BIM must be focussed and in a way that meets the needs of the users of the content of the BIM (as distinct from the users of the BIM software) which by implication must be totally integrated. On the ground there will be one building/construction; in the virtual the same must also be true.